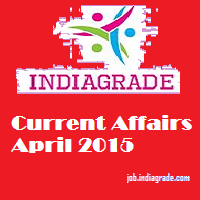 Current Affairs 4th April 2015: Everyday INDIAGRADE website will update the important current affairs for competitive exam preparation. Today we publish to currant affairs for April 4th, 2015. You can download the daily current affairs April 2015 as a pdf format and use it for future studies. If you miss the Yesterday(3rd April 2015) current affairs means then you can get it now from this page itself. Like our Google +, Pinterest, Linkedin, Facebook, Twitter webpage to get the latest job updates in social media portals. 24,000 people evacuated in Philippines as typhoon Maysak approaches. In 2050 world will get more religious. Muslims will grow faster than any other major religion with more than 73 percentage between 2010 to 2050. Peru's President names Pedro Cateriano as new Prime Minister. Indian-American professor Rajani Ganesh-Pillai wins teaching award. Top Indian mountaineer Malli Mastan Babu found dead in Argentina. Government plans nuclear missile shield in Delhi. 1022 Indians people evacuated from war zone in Yemen. President Clears Land Ordinance Reissued by Government of India. Malaysia Open: Saina Nehwal knocked out of Malaysia Open by Olympic champion Li Xuerui on Saturday. Saina Nehwal also lost his world no 1 position. Miami Open: Andy Murray to face Novak Djokovic in final by beating Tomas Berdych 6-4 6-4 in semi final. Miami Open: Sania Mirza & Martina Hingis reach final of Miami doubles open. Mr. Jai Singh is appointed as new Commissioner of Patna Municipal Corporation. He is 2007 batch IAS officer of Bihar cadre. Senior Gujarat Civil Service Officer Mr. G.C. Murmu has been appointed as Joint Secretary in Department of Expenditure. He is a 1985-batch IAS officer of Gujarat cadre & is considered as close confidant of Prime Minister Narendra Modi.